Whether it be a lot of Base Set Short Prints or Mini's, the best way to piece a set together is through lots. Often times it is easier to simply buy the card you need for $3-$5, but if you pay attention to auction lots, there's a good chance you'll get the card you need plus several other cards you don't need for $3-$5. After several times of doing this, you will have enough doubles to form your own lot to sell, giving you more funds to finish your set. 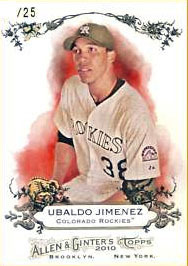 Card Stores and Shows are excellent resources when it comes to Allen & Ginter, seeing as how it's a popular product, there is bound to be plenty of cards you need for the set(s) you are putting together. Unlike eBay, you can trade doubles and other cards for the cards you need without spending any money. By far the best way to sell inserts is to complete the set, this is easier than you think, as they are often thrown into the lots I spoke of above. Sell No Numbers, Rip Cards, Mini Extensions, High Quality Auto's, Short Printed Relics, Celestial Stars, and Saltiest Sailor Individually. Sell Cabinets Cards & N43 Box Toppers Individually if at all, these are hard to sell unless they have an auto, relic, or a great player. Mini Bazooka Backs can be sold individually or in lots, it depends on the quality of the player. Use a checklist and carry it in your wallet. Try to avoid selling lots with a lot of doubles. This is Allen & Ginter, so if you pull an extremely "odd" card it could be extremely valuable. Decide what you are going to try and put together and try to stick to the plan. Check "Newly Listed" for "Buy It Nows" and Ending Soonest For "Auctions". Try and resist "over-ripping" Allen & Ginter to build a set. 2010 Topps Allen & Ginter Mini National Animals 14 Different Card Lot !!! 2010 Topps Allen & Ginter Mini Lords of Olympus 9 Different Card Lot !!! 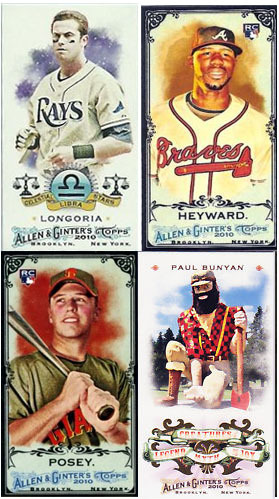 the 2010 allen ginter no number mini set is not recommended, why not?